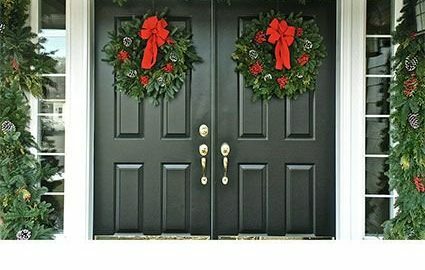 Share the joy of the season with family, friends, and neighbors when you decorate your front door for the holidays. 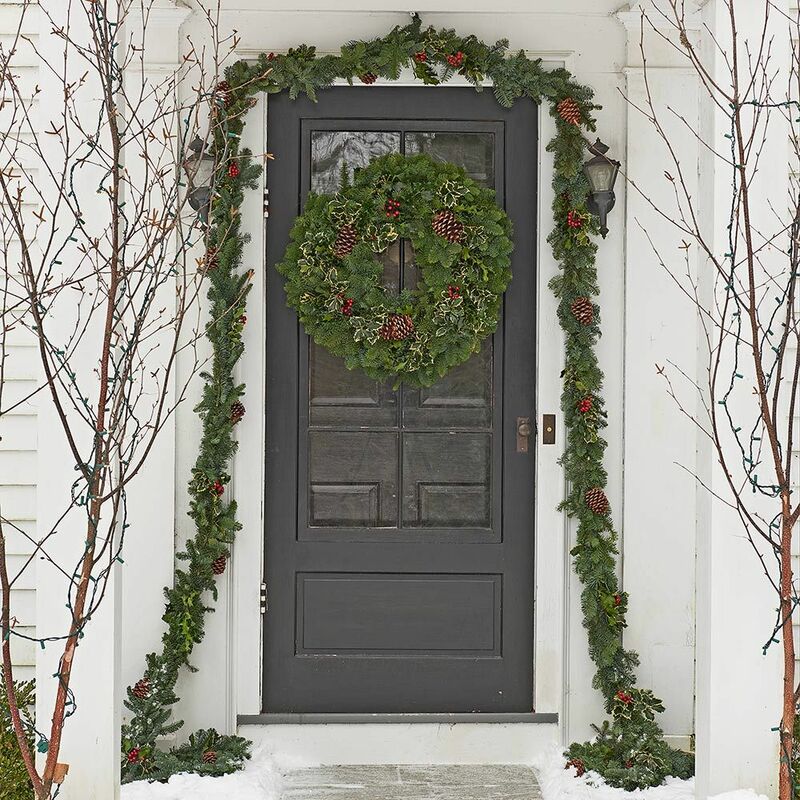 Using beautiful evergreen wreaths and garlands, you transform your front entrance into a beacon of holiday cheer. 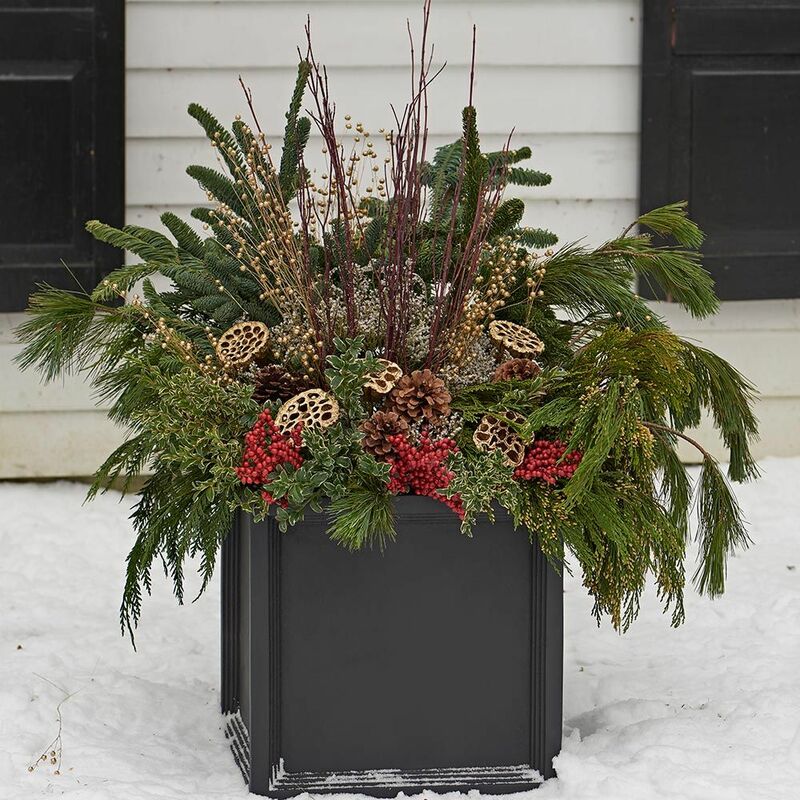 Annual planters also help create a festive look outside your home by making beautiful use of the decorations Mother Nature provides for the winter months. Take advantage of variously colored and textured evergreens, bright red winterberries, pine cones, seed pods, and colorful twigs. Scroll below for a bit of inspiration and to see some of the products we offer, and telegraph a little cheer around your neighborhood. 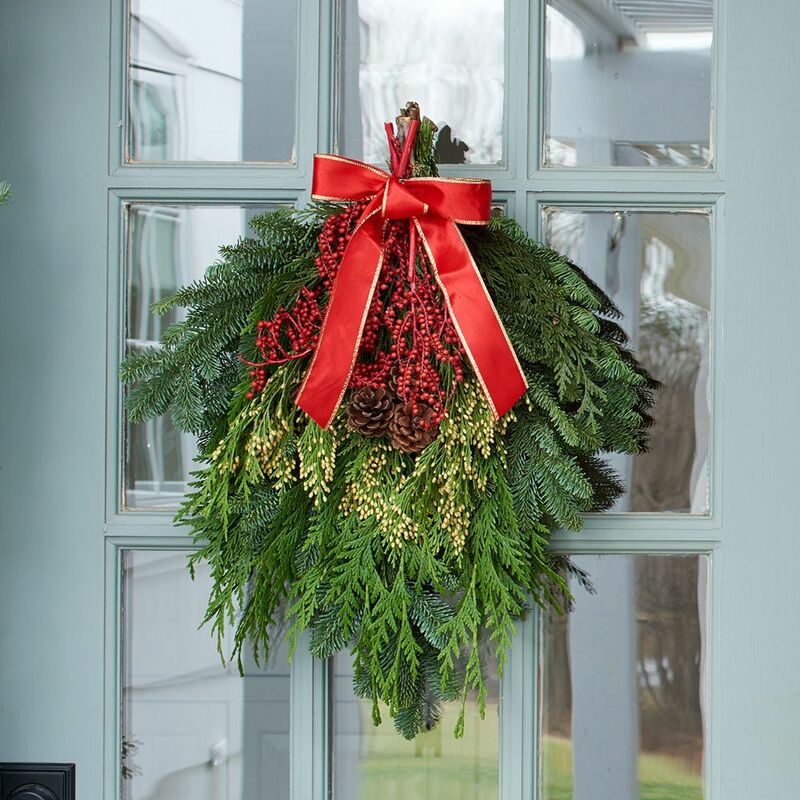 These handsome and traditional decorations hail from Oregon where members of a family-owned firm harvest holly from their own groves then combine it with the fresh-cut foliage of locally grown evergreens and Ponderosa pine cones. The sweet and tangy fragrance of these lush greens will fill a room with the classic, all-natural scent of Christmastime. 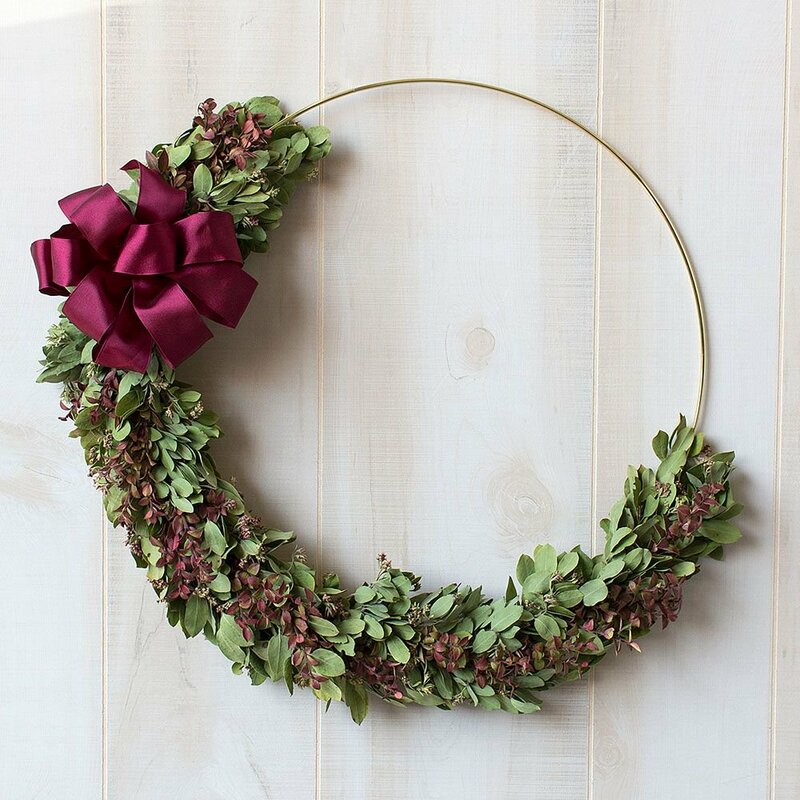 The rich, warm tones of Huckleberry add vibrant holiday color to this beautiful and inviting wreath. Arrayed on a gold-colored metal ring is a crescent of fresh Manzanita overlaid with red Huckleberry stems and finished with a burgundy satin bow. Welcome all who stop by your house with this eye-catching arrangement of holiday reds and greens. Freshly harvested, lush branches of fragrant Noble Fir, Incense Cedar, and berried Juniper are accented by clusters of red Canella berries and pine cones, then topped with a bright bow edged in gold. In the planting on the right, we feature live Chamaecyparis ‘Boulevard,’ paired with Dogwood stems and topped with frosted Pine Cones. The container on the left combines gold-rimmed Euonymus ‘Aureomarginatus’ and Chamaecyparis ‘Sungold’ complemented by berried Juniper stems. 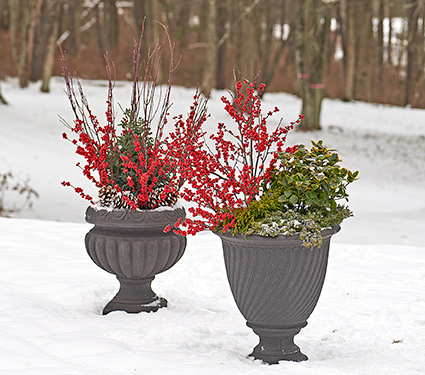 Both containers are brightened by Winterberry stems. For those who enjoy a DIY project, we offer boxes of freshly harvested greens that are ideal for filling outdoor containers and window boxes. Our Touch of Gold collections include gilded Nigella, Flax and Lotus pods to add sparkle to your decorations.